The book I am going to be interpreting is Brain Maker by Dr David Permutter. This is not a substitute for reading his book – but, I hope an insight that will lead to reading more around this subject. For too long the western diet has been moving towards an industrialised food content. The average diet (and most studies are done in the USA) contains mostly foods grown under industrial farming methods – not just non-organic – but also reliant on the heavy use of pesticides and herbicides, including the large-scale 365 housing of livestock, requiring more use of antibiotics and ‘growth hormones *in USA’, and industrially grown crops to feed them. A high percentage of the resulting crops and meat are then made into processed foods of various types. This can be of the ready-made product / meal – or the ready to use ingredient variety. In the processing the industrial makers of food products have also used ‘unusual’ methods (like hydrogenation) to change the chemical structure of food-stuffs to make them ‘work’ in industrial setting. They have also sought to make ‘created foods’ popular by exploiting our in-built love of sweet and of salty things. The problem with this is that, over the last fifty or so years, food has changed so much that our gut bacteria have changed too. This does not seem a disaster at first – after all, how important can the variety of gut bacteria be? I am sure you have all heard of the ‘good gut bacteria’ that we are encouraged to consume (from tiny bottles laced with sugar) to keep a ‘happy tum’. 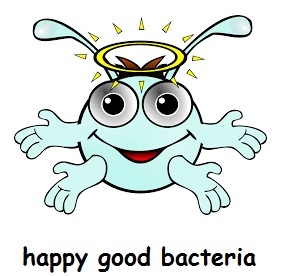 It is true – we need the ‘good bacteria’ (but preferably not from an industrialised sweetened source) and I will attempt to explain why in simple terms. A lot of this research Dr Perlmutter is basing his book on has dates between 2010 and 2015 – so much is quite new. It has been found that it is not just a matter of having the good bacteria in your digestive system – it is about having the right balance of the right bacteria in there to support a healthy gut – even some of the ‘bad’ bacteria are needed in small quantities. What the bacteria do: The number one thing that the correct bacteria do, when looking at health, is to ensure that our body has a strong defence against the things that should never get into our blood stream. After all, once in our blood stream then, whatever it is, it can travel anywhere in our body. To understand this you need to know the structure of the thinnest interface between our gut and our blood-stream. 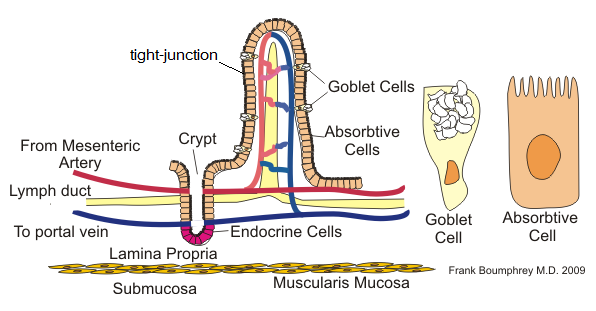 Our ileum (small intestine) is lined with villi – small finger-like projections – making the surface area for the transfer of nutrients into the blood-stream as large as possible, and it is only one cell thick! The diagram below shows a villus in relation to the blood and lymphatic system. Now I have seen people argue with this – but they were confusing the ileum (small intestine) with the colon. 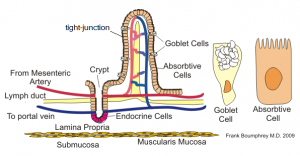 The villi of the small intestine is the interface. Nutrients from our food get from the ileum into our blood-stream either by diffusing into the absorbtive cell and then out again into the blood stream, or they squeeze through between the cells of the villi. Normally the junction between these cells is VERY TIGHT. It will only allow some very small molecules to slide between them, molecules our body is made to accept in this way, molecules we need to get into our blood stream and that do no harm while in there. Large molecules like proteins should never get through. When your gut bacteria are ‘healthy’ (of the right mix and in balance) then this lining of the ileum is protected to a certain degree – when it is not, then the gut is open to attack on this vital Tight Junction. So what would attack the tight junctions? With the bacteria defences down our cells are more open to the ‘crowbar effect’. Gluten can do this, and is the most commonly eaten protein that has this effect – components of gluten act as a chemical crowbar forcing open the gap between these cells – allowing large molecules, that have no business being in our blood stream, to slip through – this condition is known as leaky gut. What would get through and why does it matter? Pathogenic viruses and bacteria that are designed to harm us could now get into our blood-stream – this is an obvious danger – however, now some other large molecules, including proteins, are able to get through – and they can harm us too. Pathonegenic viruses and bacteria aside – what is the problem here? The problem is that when larger protein molecules get into the blood stream they begin to cause INFLAMMATION where ever they go as our body’s immune system reacts to their ‘foreign’ presence. He / we-the-world, now know different – and he is sure that many of our seemingly brain-centric disorders are, in fact, caused by inflammation of parts of the brain, and that our westernised gut population is causing this to be able to occur. As he points out, our gut biome is the equivalent to a second brain – containing as many different type of nerve cells as the brain, creating hormones and chemicals that affect not only how our bodies function but also our brain; through our moods, functionality and concentration. His first take-away message has to be – repopulate your gut with the right bacteria and keep them happy and flourishing by eating the right food for them. The second take-away message is – avoid gluten. He is not doing this on a ‘fad’ idea – but on the science that shows it is one of the main ways that this ‘tight junction’ is opened up – which then allows some of the other things that our western diet has brought on to cause more damage. Do you have a gut feeling that this is correct?